Last night was our church service since we're not having one Sunday. We had the best time!!! Everyone was so excited about Christmas and celebrating Jesus. Our church is very well-named - Celebration Of Life. It really fits our congregation. One of our associate pastors preached about God's power working in your life and that He has a plan for our lives just like God the Father always had a plan for Jesus to come to Earth. I had the idea for a small album during the service. I think I'm going to do a "journaling only" album about sermons I love and what I learn from them. Then I can reflect back on them. Today we're getting ready to go to my in-laws. I just finished three gift albums. I'll post a pic later. Here's a quick peek at my Living Room tree. I'm going to take more pics in a minute, I'm not happy with the ones I have yet. So beautiful. 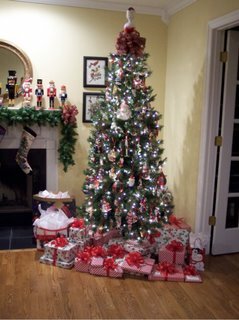 The tree :) The wrapped presents with perfect bows, the nut crackers on the fire place and stockings. Oh so beautiful! Santa had to visit a day early since daddy works on Christmas day this year. But let me tell you, it was fun, even a day early! 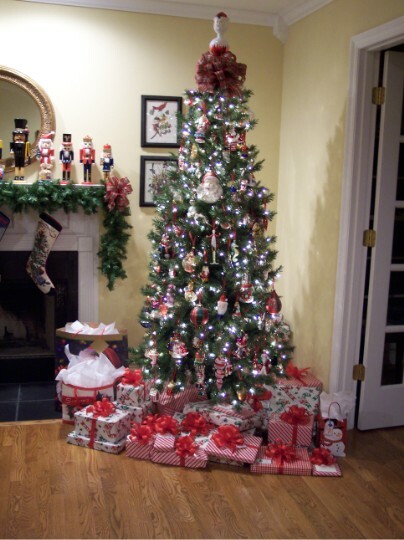 Your tree looks beautiful! I like it by the fireplace! Thank you for the goodies. Sorry I wasn't feeling good that night. I think it must have been the stress getting to me because it didn't last long. I was really afraid I had the flu!